QIPCO Holding has signed a new contract with Goodwood Racecourse to extend its sponsorship of the QIPCO Sussex Stakes for a further five years. This means that QIPCO Holding will support the QIPCO Sussex Stakes, Goodwood’s top race and the Group One British mile highlight of the summer, until at least 2017. The QIPCO Sussex Stakes, run on Wednesday, August 1, is one of three races at Glorious Goodwood next week included in the QIPCO British Champions Series; with the others being the Artemis Goodwood Cup (August 2) and the Markel Insurance Nassau Stakes (August 4). Adam Waterworth, managing director of Goodwood Racecourse, commented: “The new agreement is excellent news as continuity of sponsorship is beneficial for both Goodwood and QIPCO. 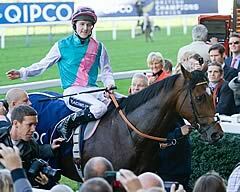 “The world’s best horse Frankel won the first running of the Sussex Stakes under the QIPCO banner last year and is set to line up again next week so there could not have been a better start to the sponsorship. “Glorious Goodwood next week features three races involved in the QIPCO British Champions Series which goes from strength to strength. David Redvers said on behalf of QIPCO Holding: “Goodwood epitomises all the best qualities of British Racing and consequently it is a perfect fit for QIPCO Holding’s increasing involvement with the sport. “Coming as it does at the mid-point of the season, the timing of the QIPCO Sussex Stakes also provides an excellent opportunity to highlight the company’s role in relation to the British Champions Series. “We are thrilled to continue supporting the QIPCO Sussex Stakes which got off to an excellent start last year with the defining horse of the season, Frankel, posting his best performance of a brilliant year. Glorious Goodwood runs from Tuesday, July 31, through to Saturday, August 4 inclusive.